Oracle of Okarito: Jock Anderson's jibe at Australians pre-Anzac Day. Jock Anderson's jibe at Australians pre-Anzac Day. Jock Anderson's controversial comments on Radio-NZ "afternoon panel" labelling Australian WW1 soldiers as "lazy bludgers" are hard to fathom. Did the comments come from other historians re-inventing history or were they a tongue in cheek jibe at the Australians, a trifle overdone? I listened to the playback and Jock delivered them with an authentic tone. I'd say he now regrets them or he ought to. The comments defy logic. Anyone who visits the Australian outback is struck by how harsh the environment is, especially without air-conditioning and modern vehicles. Even today Australians from the bush are tougher and more capable in the outdoors than most nationalities. My grandfather, Bill James, fought in the Somme briefly, before catching measles.. He survived the remainder of the WW1 by joining the regimental band. I have his personal diary and the hardship he suffered is well documented, cushioned by his special humour. I've heard old-timers say the British fed their horses better than the colonial troops. I can't imagine it was any easier at Gallipoli. Bill James mentioned having to steal eggs off Belgium farmhouses, but was also grateful for the food generously provided by local families. He was often half starved on army rations. As a child I was particularly interested in WW2 and I read many of the books written by Churchill and NZ soldiers in the late 1940's and 50's. My father was medically unfit for war and served in the home guard but my Uncle Jack Richards of Whangarei served in Egypt and Crete. He was captured in Crete and survived the sinking of the Nino Bixio in 1942 by swimming in the sea for several hours before being rescued (by the wrong side). In my opinion, there is no way he or the fellow Australians in that war could have been described as bludgers. I've heard ex officers in the 1950's saying that Britain would never have won the war without the troops from her ex-colonies and the USA. The crucial difference in the quality of the colonial troops related to the skills they learned from being mainly farm boys. They were used to fixing machinery and travelling long distances. If the tank or truck broke down they could fix it immediately. In contrast, the British or German troops would wait for the engineers. As for the character of modern Australians, the great grandsons/daughters of the diggers, this I can attest personally from clients we had in our kayak business at Okarito. When conditions got tough, that is paddling in the cold and wind and against the tide, young Australians performed as well as any NZlders, and better than other nationalities. The whole affair seems like many others these days, reinvent history or make shock horror statements simply to gain notoriety. Thank you, from an Australian soldier who was on the Kokoda track`s daughter. 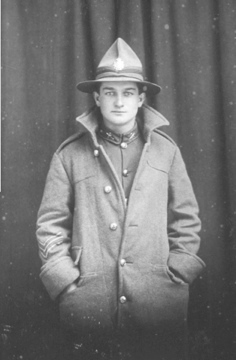 James Maurice Neville joined when he was 19 and returned with the last of the troups from New Guinea when he was 23. I emailed Jock Anderson and told him how disgusted I was regards his comments. My father was no bludger. He came home a different man my mother once told me. Thank you for your comments on this page, Iv been feeling really angry inside.